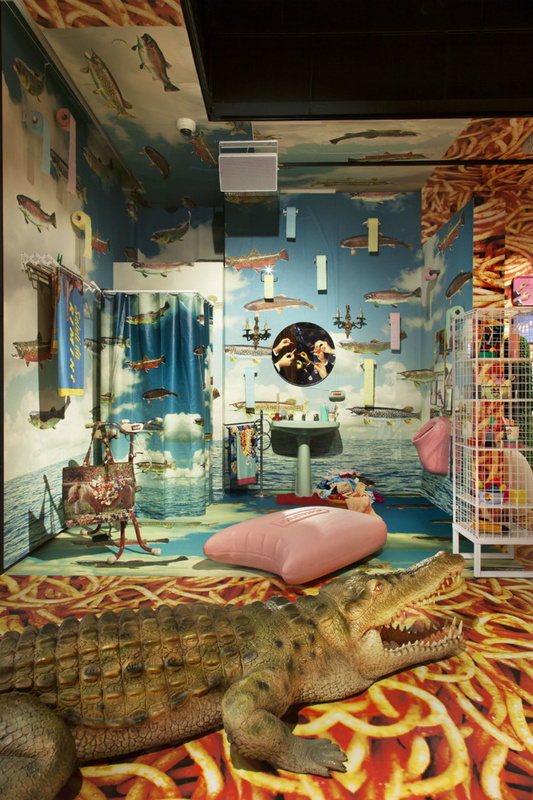 The Gallery at Cadillac House, located just west of Soho, is hosting Toiletpaper Paradise—an exhibition that is as eccentric as it sounds. 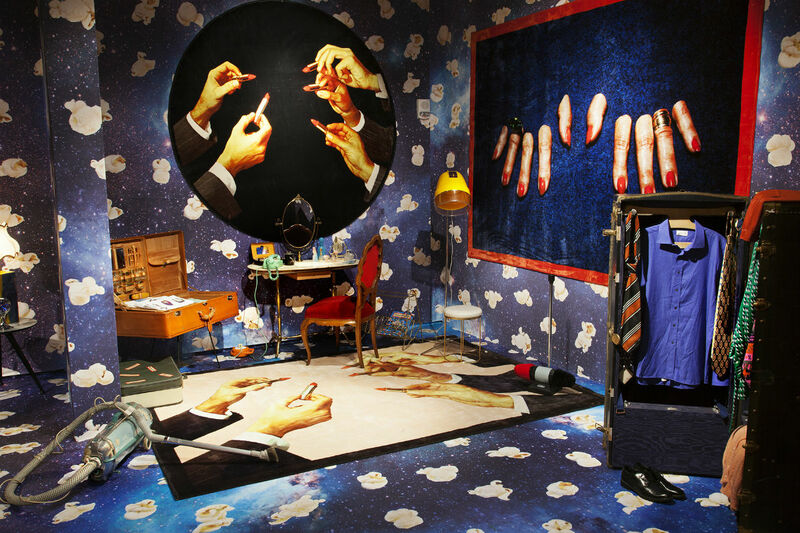 Toiletpaper Paradise invites audiences to touch, play, move, sit, recline, and position themselves in the visual antics of artist Maurizio Cattelan and photographer Pierpaolo Ferrai’s curated space. 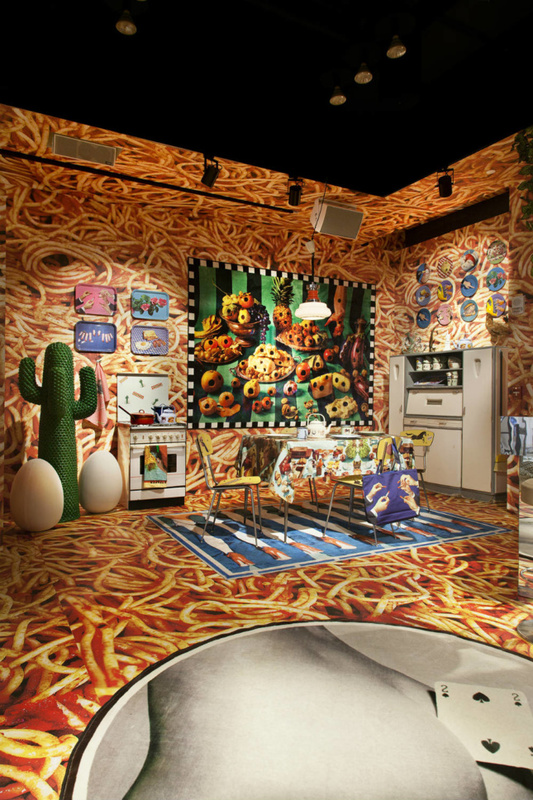 The kaleidoscopic spaghetti world features over-sized stringy pasta pasted to the walls and floor joined on either side by enclaves of further obscurities enamored with space popcorn and cloud fish wallpaper. 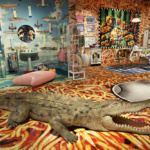 This description alone should suffice in setting the tone for the exhibit: The inclusion of risqué carpets, a life-size crocodile, tombstone, and ionic column are strangely unsurprising inclusions in their context of peculiarity. 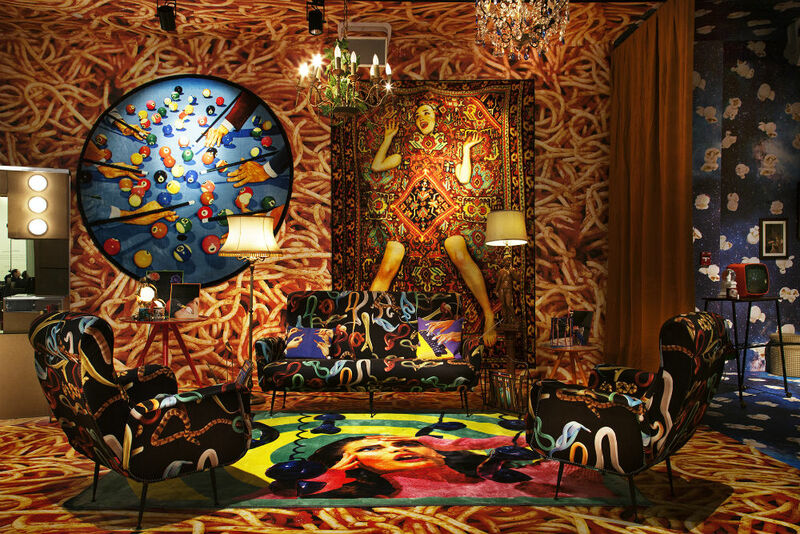 Though overwhelmed with imagery, furniture and accessories of note have been interspersed throughout the space. 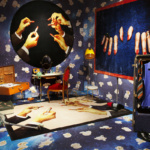 Despite not jumping out at you as much as the wallpaper, a range of midcentury modern furniture can be found within the setting, a feature that has led the exhibition to be dubbed “Mad Men on acid.” Meanwhile, if you can spot them, works produced by Italian homeware manufacturers Gufram and Seletti are on display, all carrying with them inflections of Toiletpaper Magazine‘s off-beat Instagram-ready aesthetic. 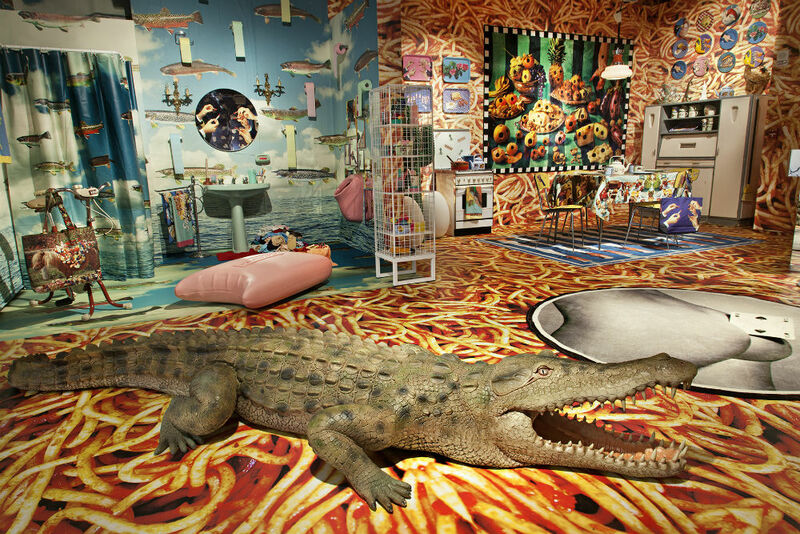 The exhibition was made possible through creative media agency Visionaire and Toiletpaper Magazine; Ferrari and Cattelan are co-creators of the latter. 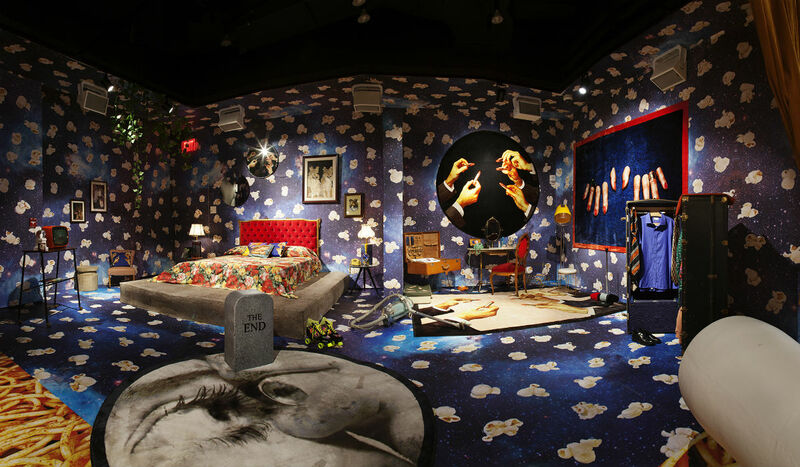 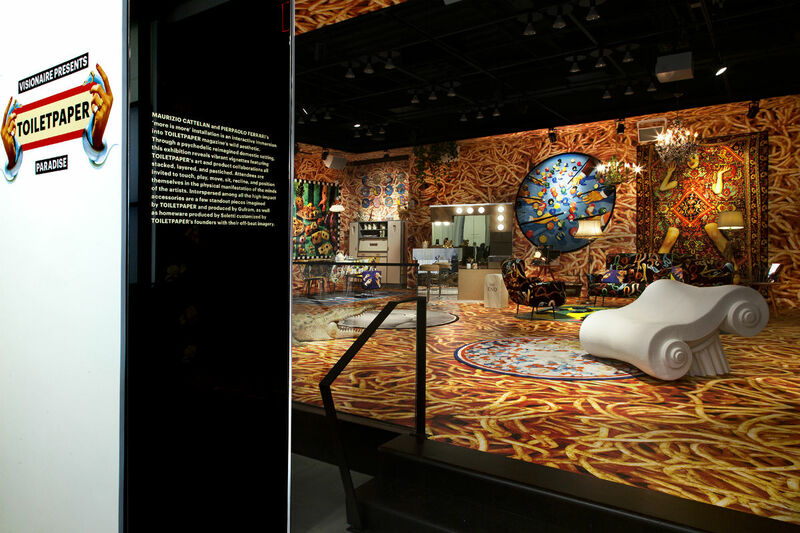 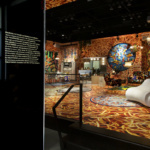 Toiletpaper Paradise runs through April 12 and is free to the public.